All pricing is based on stock availability. If stock for this product is unavailable, we may need to revise quote based on an alternative supply source. The freight amount is a guide only and actual amount will be based on total order. All indent orders, being those custom-decorated or specially made overseas to your specifications will require 50% deposit payable on placement of order. Quotes are generally valid for 14 or 30 days. All written quotes will display expiry date. We reserve the right to withdraw a quote based on extra-ordinary circumstances, for instance factory closures, natural disasters. Due to the large possibilities in regard to product decoration, we can only give you an estimate without sighting artwork. Quotes may be subject to revision on sighting artwork or product. You will be asked to confirm artwork. It’s the purchasers responsibility that the artwork does breach copyright or trademark law. What are your standard response times for quotes? Its our policy to respond to genuine enquiries by end of the day, where received before 3PM. If you don’t hear from us within 48 hours, there may have been a techinical problem, please resubmit your request. Some quotes may require us to obtain information from overseas, but in these circumstances, we will let you know of extended response times. What information will I receive on my quote? All quotes contain product description, lead time, minimum quantity, price per unit, and calculated totals including GST. If we know your delivery details, an estimate of freight will also be included. Generally, quotes are subject to sighting of artwork, so if you can provide this with your request, that will ensure accuracy. We prefer to detail all quotes in writing. 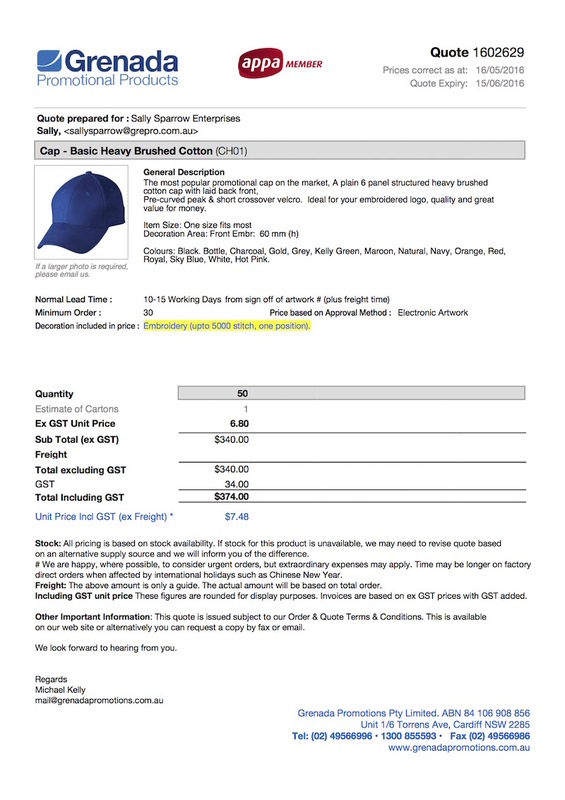 Each product including description, photo (in most cases), prices etc will normally be formatted on one A4 page. The most common method is email in PDF to you, but we can also mail the quotes. Or, they can be held for collection at our showroom, where we can show you samples of the products. How much is freight ? Unless otherwise stated, all items are subject to freight. We include an estimate on your quote where delivery address is known. Can you quote without sighting artwork ? If unsure about a process, please discuss the limitations of particular decoration method. The customer will be asked to confirm artwork. It’s the purchasers responsibility that the artwork does breach copyright or trademark law. What will my quote look like ?